In 2009, NDATV held our first Dart night, goofy golf and conducted our first mid week ride. We held a St. Patrick’s Day and a Valentine Dance. We had a Castleton ride, a weekend in Apsley, a Haliburon Forest ride, our first Marmora Weekend Ride and our first 5-point ride. We continued to believe in training and held several GPS courses and ATV Maintenance seminars. Members of the Northumberland District ATV Riders Club and the Kawartha ATV Association underwent a training course to become youth ATV rider safety instructors. The objective of the program being launched is to meet with area youths, through school programs and various club sessions, and teach them ATV rider safety and education. An historic milestone was reached with representatives of ATV interests in the province of Ontario to speak with One Voice. A partnership was created to provide a forum for ATV sport organizations to explore issues, share and create solutions and thus enabling there to be one voice on these concerns relating to ATV best interests in the province of Ontario. volunteer trail wardens are ambassadors representing the NDATV club, landowners with whom we have landowners agreements with, and the sport of ATV riding. In November 2011, The Northumberland District ATV Riders Club website was completely redesigned by Canadian Business Computers. Besides the new look the website is now more modern and is using WordPress. WordPress is the popular and open source blogging tool of the internet. NDATV executives and several wardens attended the Municipality of Trent Hills meeting to consider the Northumberland District ATV Riders Club request for an ATV road use by-law. This was a request to link through Trent Hills to enable us to join our trails in the Cramahe and Alnwick/Haldimand area with the EOTA trail system. The request did not pass. Northumberland District ATV Riders Club was formed in 2006. In 2007 and 2008 there were many firsts for the NDATV club: we held dances; euchre tournaments; participated in the Apple Blossom Festival, the Applefest, Grafton Canada Day, and the Warkworth Santa Claus Parades; participated in the Relay for Life Cancer Walk; started our ATV Maintenance Seminars, GPS courses, and held our first First Aid/CPR courses; a fundraising ride in memory of Lizzy Corbeil and our first fundraising ride for “Food for Thought School Breakfast Program”. Of course we had rides, road trips, participated in KATVA’s Fundraising Ride, our first scavenger hunt ride, an ATV rodeo, and participated in Earth Day cleaning up garbage on our trails. 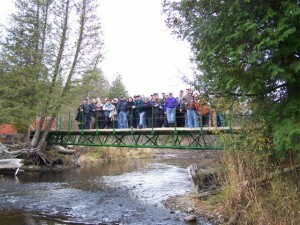 Also in 2007, NDATV constructed a bridge over Cold Creek. The bridge was built September 1, 2007 and passed the final engineering inspection. This bridge has a span of 52′ and sits 12′ off the water. This bridge was the brainchild of Al Chapman and Robby Dekeyser. They started on this project in the spring of 2006. With the assistance of both members and non-members of Northumberland District ATV Riders Club we have made this part of our trail both safer and more environmentally friendly. On September 13, 2008 a dedication ceremony and stone unveiling was held during the 2nd annual Ride for Lizzy event, dedicating the Cold Creek bridge to the memory of Lizzy Corbeil.